The quote comes from the movie Risky Business. Joel, the character played by Tom Cruise, is much like a teenage version of an HR pansy. Coasting through life on smarts, good looks and a fear of doing anything that challenges the status quo. Until his friend Miles pushes him to get out of his comfort zone. Many of you know the rest. In the end, Joel learns a valuable lesson about taking risks. One of my biggest pet peeves is when HR acts as the compliance police as their primary role. Yes, you are the conscious of your organization. You’re also expected to stop bad behavior. But when did this ever become the playbook for conservatism in your everyday actions? You are not the legal department. You are not the clergy either. Being responsible and appropriate is not an excuse for failing to take some risks. I have taken plenty of risks during my HR career. A few have ended miserably. And a few have gone for grand slams. If you take a risk and fail, it should be a learning experience, not a sign to never take another chance. I have taken my share of risks on folks who didn’t fit the image my organization wanted me to hire. At one of my last organizations, I referred to the boiler plated hiring as the Stepford Wives (another great movie you should all watch). Everyone hired looked and sounded the same. I look for unique qualities, that aren’t in the job description. Sometimes my hunches worked and occasionally they didn’t. I viewed it as creating diversity, not homogeneous hiring. 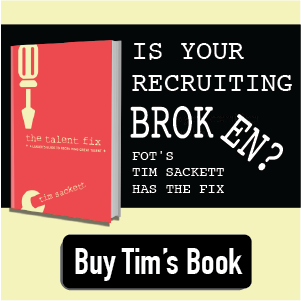 Recruiting software companies are cringing as I say occasionally go with your gut. Now let me be clear, I am not advocating for all HR executives to go rogue or off script daily. I am suggesting that HR needs to get out of its comfort zone and take a few risks. Marketing folks do this all the time and they build a resilient persona towards failure. They accept and embrace it. Their creativity, in part, emanates from their ability to push past failure and take risks. Maybe that’s why HR has not shaken the merit badges of conservatism and being Pollyannas that it has earned over the past 25 years. It probably contributes to the multitude of bad press it has garnered since Fast Company magazine first said “let’s get rid of HR” over a decade ago. I say be bold, have conviction, and back it up. A few years ago, I pushed myself personally and professionally as a speaker at DisruptHR in New York City. I have spent the past decade speaking at major conferences, to senior management, and boards of directors. I am more than comfortable in a traditional setting, but this was different. Five minutes and twenty slides rotating every 20 seconds without my control. I had to make my points quickly and use my slides as a backdrop instead of as the main point of focus. I did ok and it has changed the way I approach presentations going forward. Fewer words and get right to the point. My success was not in how others viewed my presentation, it was in building confidence to do something out of my comfort zone. Overall it was a B-minus presentation, but something to build on. Like building muscles in the gym, it hurts at first and is uncomfortable. Then you get used to it and you get stronger. So, many of you may be asking, how do you take risks at work? Well, let’s start with challenging how you operate every day. Sit in a conference room a few times with your colleagues and evaluate some of your practices. Ask WHY, repeatedly. Why do you do certain programs, why do you do things a certain way? Get to why can’t you either change or scrap a business practice. Examples might include: why do so many folks need to sign off on reviews, or why do you do on-boarding on Mondays. You can look at everything or anything. Then the hard part starts. Do you have the fortitude to change a practice or policy? Do you have a voice with decision makers? Maybe this is the best reason to take a risk, not to change something, but to put yourself in the situation of presenting change to your leadership team. Building a voice that is heard may be the biggest risk of all. In the end, what is the worst that can happen? You don’t make a change. You keep a practice or protocol in place. The growth and victory come from going through the exercise, not the result. What are you waiting for…Just say what the f….